I’m sticking with my first impression that Kuala Lumpur isn’t anything too special, but a large chaotic city, with horns constantly honking, people rushing to anywhere and everywhere and buildings galore. I did get the chance to have a few adventures when I was there though. 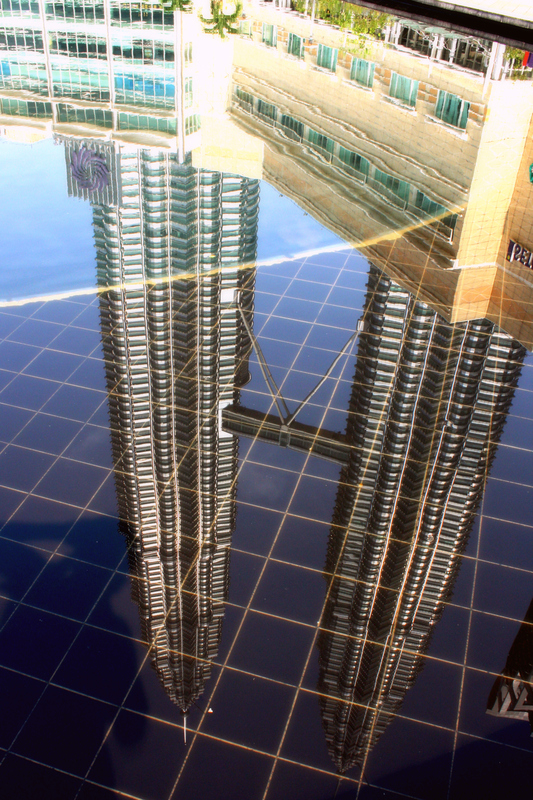 I had read that the Petronas Towers, the world’s tallest twin towers, only open 1300 tickets (and rumor is they sell out pretty quick) to go up in the Sky Bridge every day so I wanted to get there early to insure that I could get a ticket. I arrived around 9:30 in KLCC (Kuala Lumpur City Centre) and received a ticket for 12:15, so I had some time to kill in the enormous surrounding mall. My couchsurfing host, another avid photographer, had informed me that there was a photography exhibit on the third floor. It was the Sony World Photography Awards Global Tour and it was only in town for a month. How lucky was I to get to see it!? I spent a good thirty to forty minutes examining the works of art, which ranged from people to landscapes to action photography and it all was so incredibly interesting. I love looking at other people photographs because it inspires me to go out and make my own unique shots. After eating a delicious breakfast of Nasi Lemak at a restaurant in the mall, I took a stroll in the neighboring Taman Park and shot some pictures of the two towers. The park was peaceful and had a water area where kids could play and parents could relax in the shade. Pretty soon, before I knew it, it was time for my adventure up to the Sky Bridge. The tour began with a video about the Petronas company. Not really the most exciting material, but they made it into 3D so I guess that makes up for it, although it wasn’t the most high quality 3D I’ve seen, Avatar was much better. We then queued up for our 30 second ride up to the 41st floor where we would enter the Sky Bridge. We were given ten minutes (which surprised me because I was told only three minutes) and set loose to roam the bridge. The view was amazing and I had to try and not think about the fact that there was really nothing below me except a long plummet down. I was so glad that I did the walk and I probably could have stayed up there for hours just staring at the city skyline. I kept moving from one side of the tower to the other and back again. I just couldn’t get enough! Jumping on the train, I moved on to the Central Market, a place I deemed entirely too dangerous to linger because I wanted to buy everything in sight. Indian paintings, Chinese sculptures, Thailand sarongs, Malaysian souvenirs. You name it, this market had it. I had to get myself out of there, and quick, because I was about to overflow my backpack with objects I know I didn’t need. I did a quick walk through Chinatown, it really didn’t look like anything I hadn’t seen before, and decided to embark on a quest to find the Islamic Arts Museum. And I am so glad that I did. After wandering around for a wall, looking like a typical tourist with my map help up high and spinning in circles, I found the museum. Its usually 12 RM to get it, but I said I was a student (don’t judge! I’m going back to school eventually!) and I received half price. The museum guide motioned over to a special exhibit that was only here for a couple months and when I saw what it was I knew I had come to the right place. 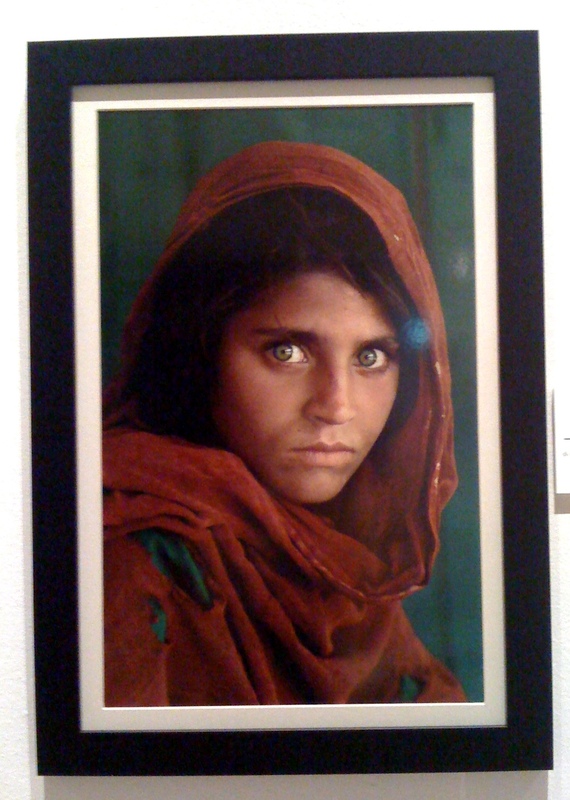 Steve McCurry is the National Geographic photographer that took the most famous picture of the Islamic girl in a burgundy headdress with the bright green eyes. I entered a room filled with his photography of Islamic people and from Islamic places and I was in photography heaven. I spent at least 45 minutes in the room. I would study one picture then move on to the next, only to return to the one before it to study it again. It was amazing and I can’t believe that I was in KL to catch it! The rest of the museum was great as well. My favorite exhibit was the Qur’an and Manuscript Gallery. I had never seen such beautifully written manuscripts. Hours and hours had to go into each page of these holy books. The calligraphy was unbelievable and I can’t imagine using such an ornate book as my worship guide. I stared at each one of the books for a few minutes and just imagined someone putting all that time and effort into it. There were also extremely small, pocket-sized versions, which had the same beauty. I had a great time perusing the other exhibits of the museum and would definitely recommend it as a must-see spot. 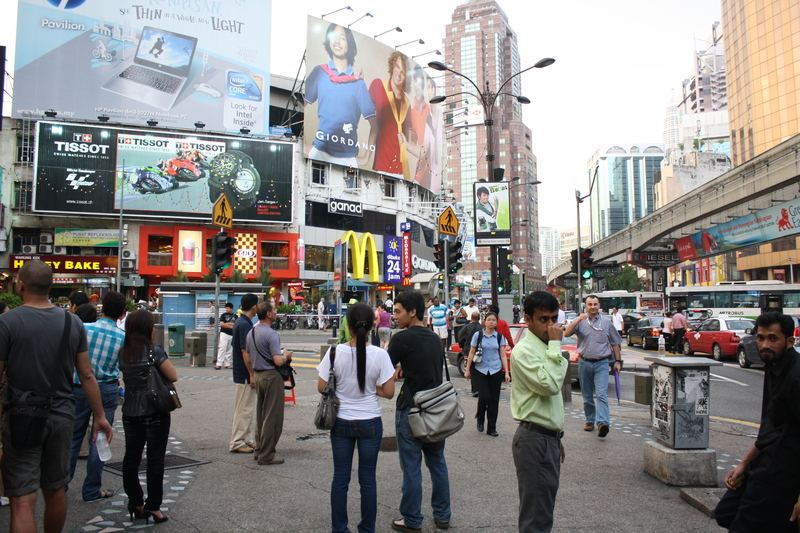 I checked out Bukit Bintang, apparently the backpackers spot in KL, and it was some of the best people watching I have ever had! While I waited for another couchsurfing acquaintance for dinner, I posted up at a spot on the stairs by the Monorail station and observed the constant foot traffic. People watching is one of my favorite things to do so I didn’t mind the wait! We grabbed dinner at one of the hawker stalls. I tried frog legs and stingray for the first time! The stingray was delicious, but I’d have to say the frog was nothing to write home about. 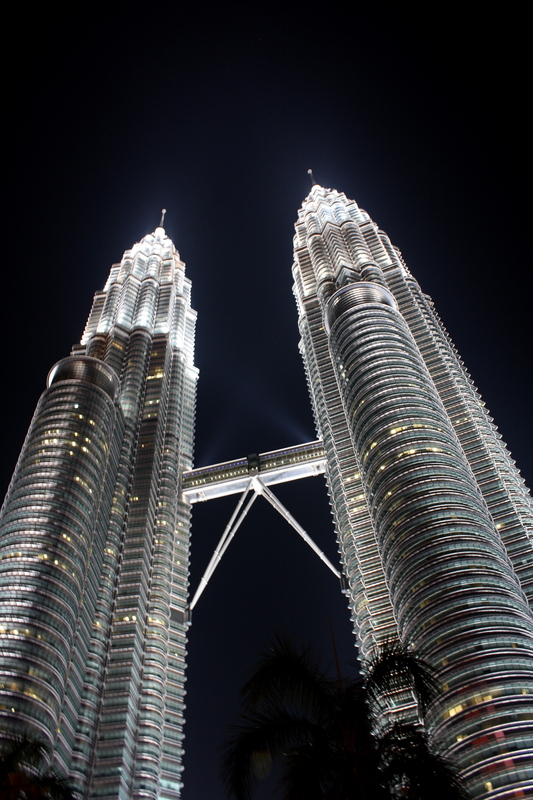 We grabbed a drink, which is a much pricier than in Thailand, and then headed over to the Petronas Towers so I could get some night shots! 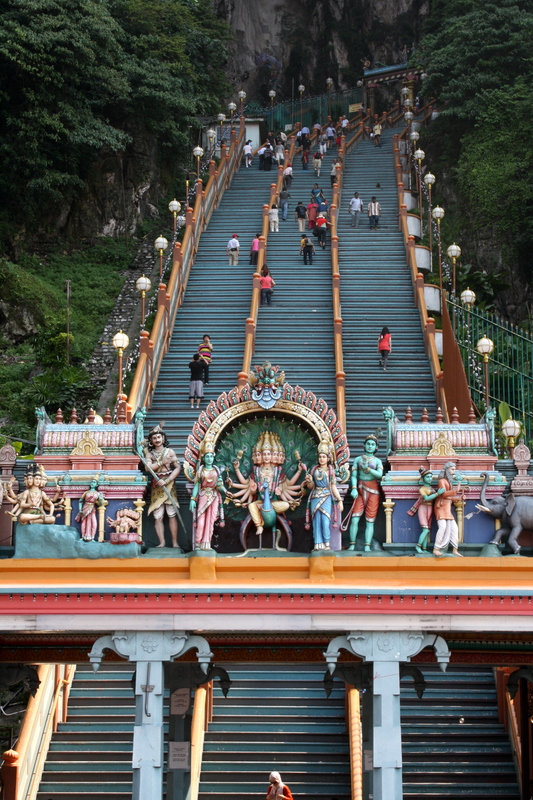 My last stop before I boarded my plane to Singapore was the Batu Caves. I had to take a 45-minute bus ride to get out there, which was a task in itself because I was advised in three entirely different directions by three different people on how to get to the bus. On the way I realized that I was going to be cutting it close to catch my flight to Singapore, which gave me a small, constant anxiety. I got there around 10:45 and gave myself about 45 minutes there (usually a visitor should take about 2 hours to explore the caves and surrounding areas), so I definitely rushed myself a bit, but I’m glad I went nonetheless. The caves were enormous! I had to climb flights and flights of stairs to get up to the first cave, where there were Indian statues, with water dripping and the sounds of bats coming from above. When I got up to the last cave, I couldn’t help but straining my neck up for long periods of time because it was so beautiful! It was quite the experience! I personally love KL, as it is a perfect confluence of cultures, food and people and a snapshot of what Malaysia truly embodies. 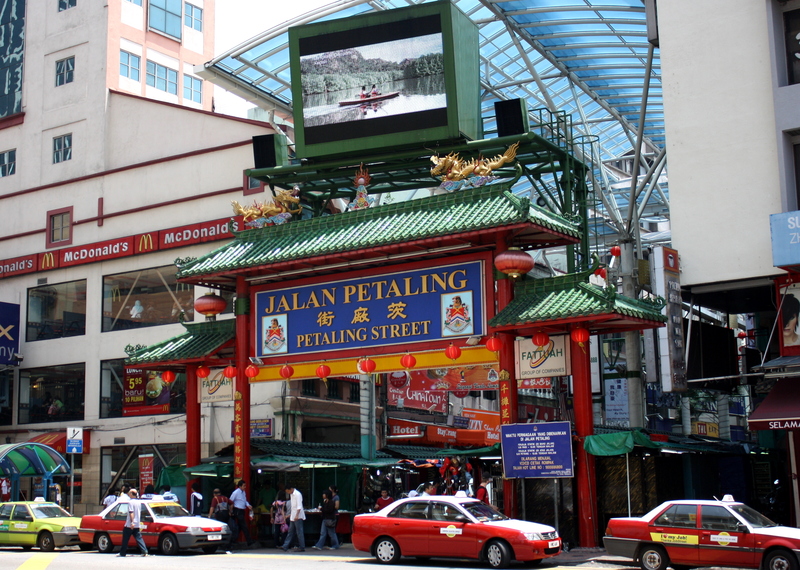 Malaysia’s complicated and often acrimonious history necessarily means that some weighty emotions lie beneath the surface of the city, which (for me) added some additional colour to my time there. 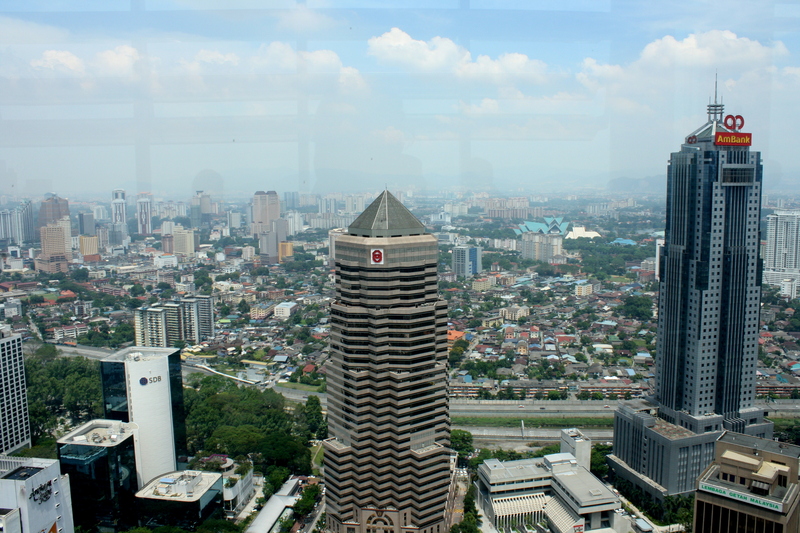 Next time you are there, go up Menara instead of the Petronas towers, so that the towers are in your view as from the top. Also: Wong Ah Wah has the best chicken wings I have ever tasted (at the end of Jalan Alor), if you’re in the market for some bird. safe travels, and enjoy Singapore!